Pan the Goat-god comes again! Pan is all, and all is Pan. Welcome to the Rite of Pan website. This site is dedicated to the Great God Pan, in all of his many aspects. Pan is a God who inspires poetry and ritual, so here you will find poems, songs, stories and magical invocations to Him. by Sir Edward Burne-Jones. Painted around 1872-74 in oil. It is currently in the Fogg Art Museum at Harvard University. 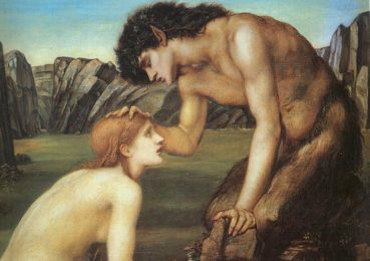 In the Greek myth depicted in this painting, Pan is advising Psyche to devote herself to winning back the heart of Eros.